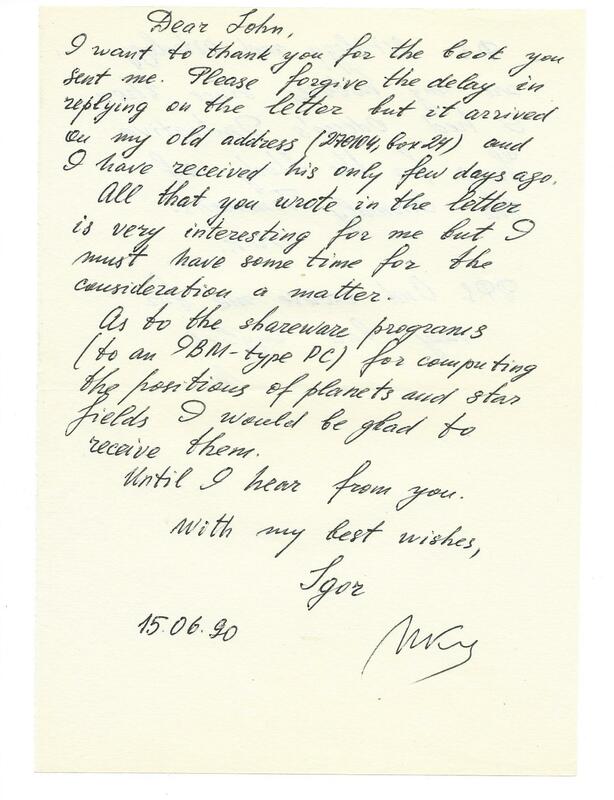 The following scans are from the books and letters that were a part of the personal collection of John Costello, translator and science fiction fan who passed away earlier this year. John had worked closely with Kir Bulychev, one of Russia’s best-known and beloved science fiction authors, and was actively involved in promoting Russian science fiction in the US. I felt the following documents might especially be of interest to Russian fandom, and am sharing them with permission from ReaderCon. Click on any of the images to see the full version, and feel free to download/share/post them as you see fit. 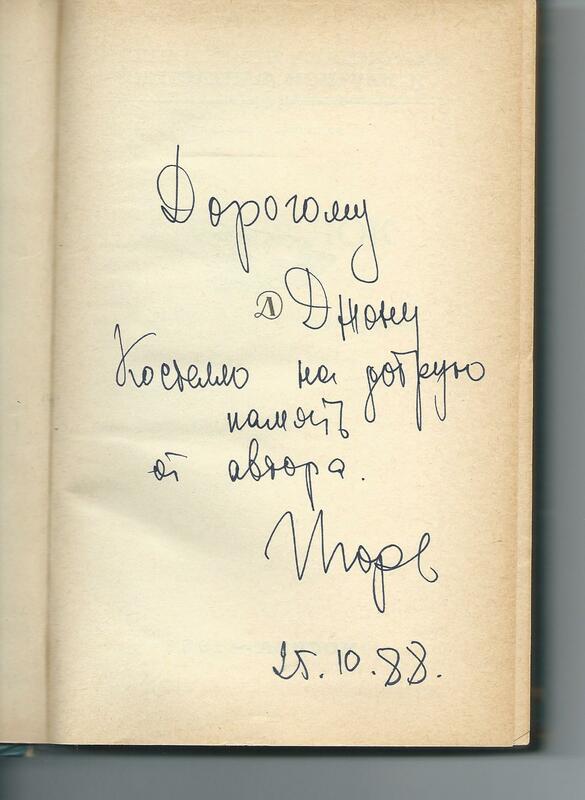 There is a number of books in the collection autographed by Kir Bulychev and signed to John Costello. 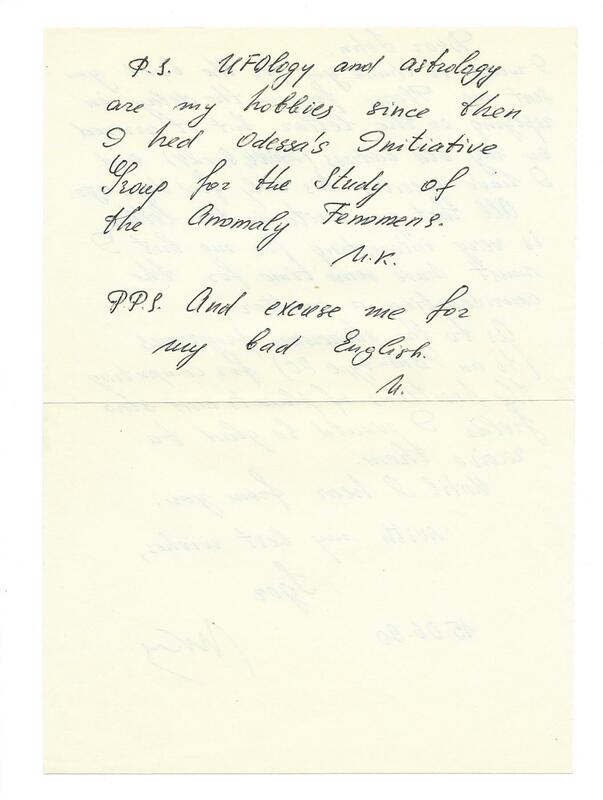 Most of them are merely signed with a brief note of well wishes, as the one above, but there are several with interesting notes that I am posting below. 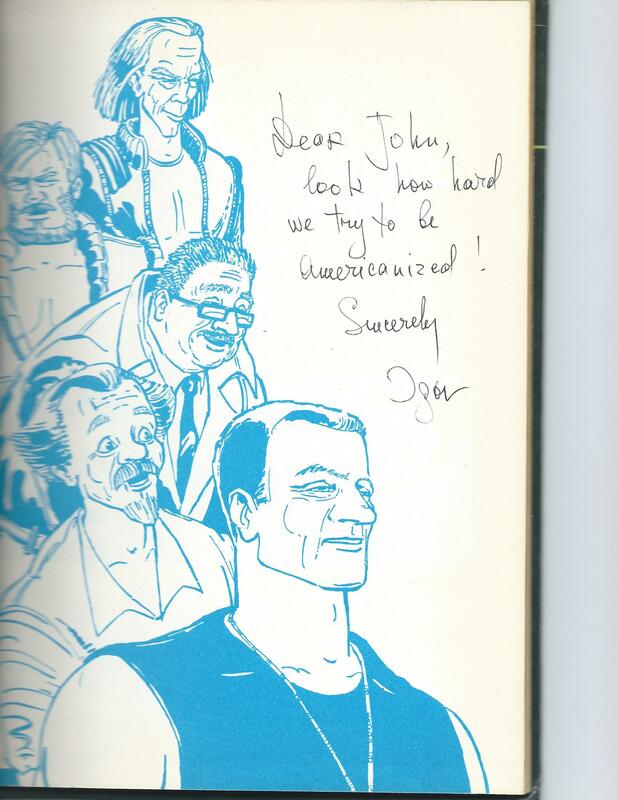 If there’s interest in the other “basic” signatures/dedications, I can scan those upon request. A self-portrait sketch by Kir Bulychev. 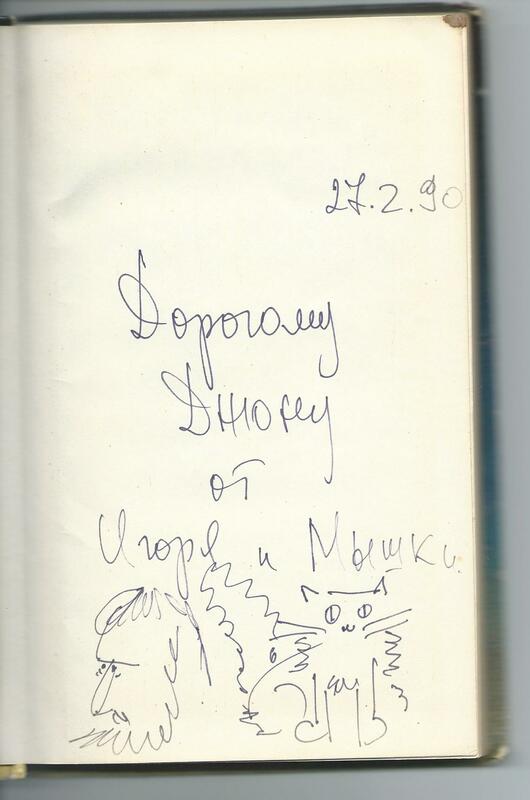 He writes “from Igor and the Mouse” though that definitely looks like a cat to me. May have been some inside joke between Kir and John. 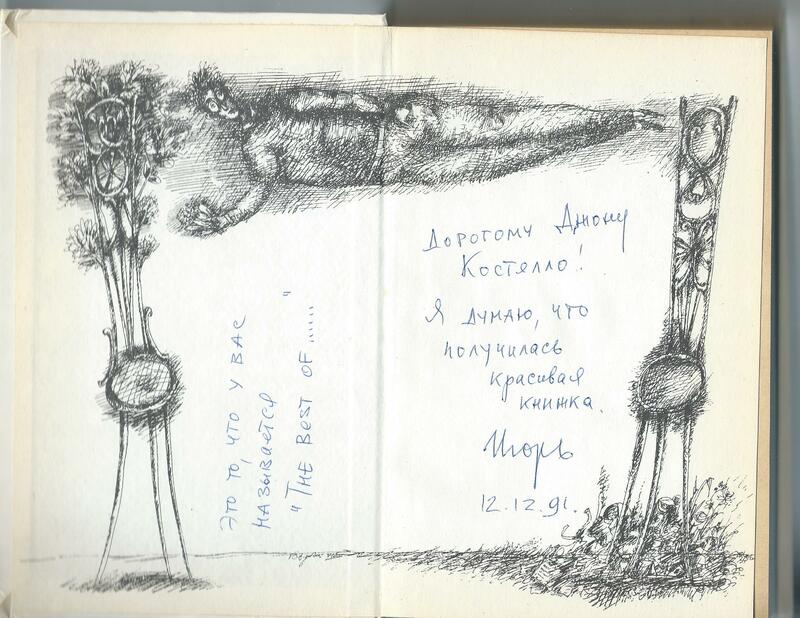 This is from the flap of “Коралловый Замок” (The Coral Castle). The only dedication in English. From the flap of “Андрей Брюс, Агент Космофлота” (Andrei Bruce, Spacefleet Agent) hardcover comic book, circa 1993. Comic books were not a well-known media form in Russia; this must have been one of the earlier such publications, and it was based on Bulychev’s writing. 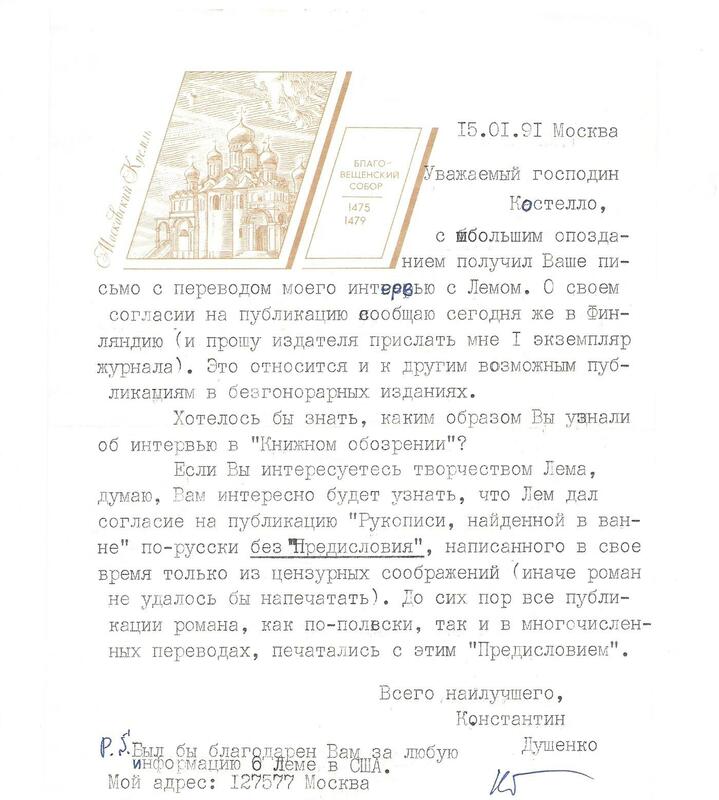 The letter from Konstantin Dushenko to John Costello, granting permission to reprint the translation of Dushenko’s interview with Stanislaw Lem and requesting a copy of the publication. Dushenko goes on to ask how Costello found out about the interview, published int he Review of Books, and goes on to comment on Lem’s assent to the Russian-language publication of the novel “Memoirs Found in a Bathtub” without the foreword he was originally forced to write so the book would be able to get past the censors. Dushenko notes that all previous editions of “Memoirs” in the original Polish and in translation were published with this foreword. Front and back of the letter from Igor Nikolaevich Kovshun, a noted UFOlogist and head of “Proteus,” the SF fan club in Odessa, Ukraine. 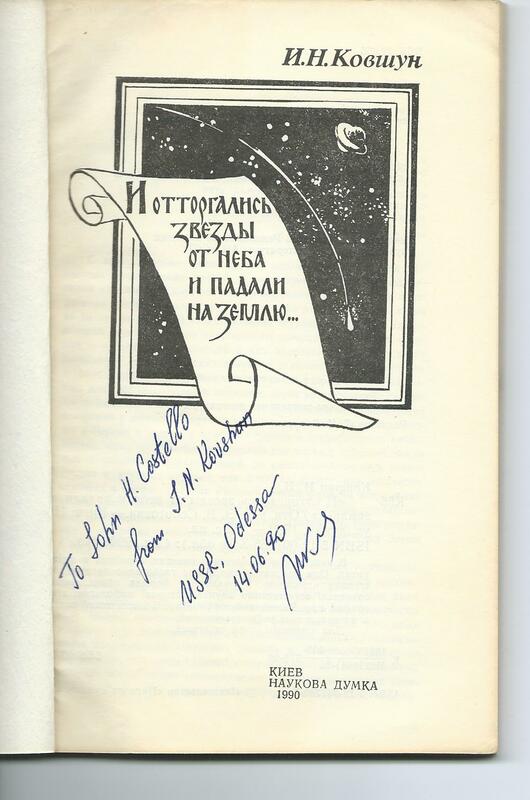 A copy of “The Stars detached from the Sky and Fell to Earth…” autographed by Kovshun. This entry was posted on Monday, July 13th, 2015 at 11:43 am and is filed under Uncategorized. You can follow any responses to this entry through the RSS 2.0 feed. Both comments and pings are currently closed. Thanks for sharing this. One of the most valuable things to me is your occasional mention of science fiction writers and illustrators in the former USSR. It’s a world most Americans aren’t acquainted with. I hope you’re able to continue publishing works in translation. Thanks! I am constantly working on that, at least as much as time will permit. There’s an awesome novelette by Tatiana Ivanova that I’m shopping around at the moment. Hope to find a good home for it soon.